Makes 64 pork and prawn potsticker dumplings. Step 1. Gather all ingredient and prepare to make the mixture. Step 2. Place all ingredients except for the chicken stock, vegetable oil and wonton wrappers in a bowl. Mix together well or use a food processor to combine. Leave to stand for 5 minutes. Step 3. Take one teaspoon of dumpling filling and place it in the centre of the wrapper. Press the wrapper in half and then then pleat into six pleats on one side. 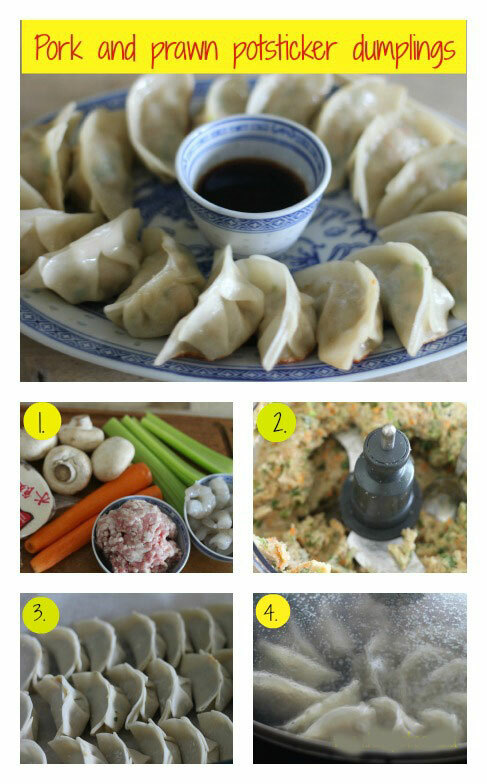 See our video below for the steps to folding dumplings. Continue making the rest of the dumplings. Step 4. Heat a heavy-based frying pan with two tablespoons of oil in the bottom and drop in the dumplings when hot. Fry until the bases are golden.Add 1/3 cup (80ml) chicken stock to the pan and place the lid on to steam the dumplings for 2-3 minutes or until the stock has evaporated. Remove the lid and fry for a further minute or so. Remove from pan and serve with dumpling dipping sauce. This recipe makes 64 dumplings which is a LOT! You can freeze these before cooking and then put them in the pan frozen and proceed to cook as above. Shao tsing rice wine can be bought in any supermarket and only costs about $3.50. This recipe has a LOT of ingredients. If you want to try this and you don’t have all of the ingredients just go with what you have. The meat, shallots, garlic and seasoning will still taste delicious.